Well, the wife and I went to the local cinema to see “Super 8” because the kids had been imploring us to go see it, so we did…and we loved it. It was sort of a mix between “E.T,” “War Games,” “War of the Worlds,” and “Night of the Living Dead,” with plenty of kids putting one over on “the man,” and enough sentimentality at the end to make you want to cry, but you dare not if you’re out with the boys, but since I wasn’t, I gave it some thought, but chose to remain wet-face free for dignity’s sake. By the way, it’s a zombie/space alien movie, and it’s practically a sin to get all weepy-eyed in one of those. I like zombie and space alien movies. In fact, I wouldn’t mind if an alien from outer space landed on Earth tomorrow and shook things up a bit. You know, make us question our place in the universe, not hunt us down and make hamburger patties out of us. Zombies I can do without. They make great subjects for Hollywood movies, but I’d rather not see a herd of them stampeding down the street, looking for a neck to nibble on. Can you imagine what would happen if aliens actually did land on Earth? There would be pandemonium. Our total belief system would be smashed to pieces. Some people would jump off buildings, some would find religion or give it up. Politicians and scientists would try to exploit them for their own purposes, and we would never look at the stars the same way again. My wife says this is a film we need in our DVD collection, solely because it’s set in the late 70s during our growing-up years. The cars, clothes, music, and household furnishings were all so 70-ish, and it was really nostalgic for her. I’m just glad that aliens didn’t come visit us back then. 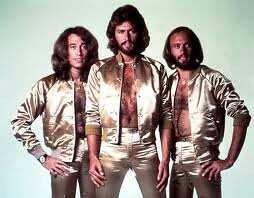 They would have heard the Bee Gees singing “Staying Alive,” and probably vaporized us right then and there. And I wouldn't have blamed them.